Ara Tyler Deysie of Parker, Arizona, was 18. Edgar Nathaniel Roberts of Hinesville, Georgia, was 39. Boise, Idaho's Joseph Arthur Moore was 54. They are just three of the more than 2,400 U.S. and coalition troops who have died in Afghanistan since the war began almost 10 years ago. This Memorial Day, explore CNN's Home and Away, sharing your messages or memories and discovering the individual stories of the fallen. You know the suicide attacker on defense ministry of Afghanistan was a man by the name of Atiqullha. who was from Paktia province ( Afgh_PAK) border. For six years he had been lived in UK and then through some one by the name of Gulzarak Sadran. who is General in defense ministry. Working as some kind of deputy for the minister, by him (Gulzarag Sadran) and his driver Captain Habibullah his relatives from Paktia. who is the driver of Gulzarag Sadran was taken to ministry of defense one day before too, to get him familiar with what is where to find the target which was a deputy minister General Anayatullullah, who is against the Taliban and Talibanizing and one day later when defense minister was not there and General Gulzarag Sadran and chief of military Mullah Sher Muhammad Karimi ( during the Taliban time he was Mullah Sher Muhammad Akhond) were not there too. This suicide bomber under the leading of Gulzarag Sadran, his driver Captain Habibullah was taken inside the ministry to kill General Anayatullah, fortunately the god is always with right people, as this suicide bomber was clamping to the second floor could not realize that there was a glass door which you can not recognize it easily, unless you not see it already, then while suicide bomber was clamping, he was hitting with the glass door then he fallen down although he already he killed some soldiers by gun shooting, this time the brave body guard of general Anyatullah, who was proactive for some incident if to be happened there, so that he was shot him, before the suicide bomber press the button of the explosive devises that he was carrying. How dare you insult the loss of lives from the other parts of the UK i.e. Scotland, Wales and Northern Ireland! It is not just England in the United Kingdom!!!! We have lost a good many brave, brave soldiers from Scotland yet no mention of them. Will you get it right! United Kingdom is Scotland,England, Ireland and Wales. I feel so angry and upset at that map where you only list English deaths.......my Scottish son has thankfully returned safely from his tour in Afghanistan and you have just cancelled out his bravery by not even acknowledging the brave soldiers from my part of the UK! Please correct the map to read United Kingdom not England!!! A soldier is a criminal, no matter if he is from Scotland or from England, in any case he is a criminal. You wouldnt be saying that if your life was in danger and your soldiers came to save you. Thankfully you are in a minority who have the greatest respect for the troops out in Afghanistan and personally I couldn't care less what you think. You wouldnt be saying that if your life was in danger and your soldiers came to save you. Thankfully you are in a minority. the majority have the greatest respect for the troops out in Afghanistan and personally I couldn't care less what you think. Well put,salerno and just ignore this ignoramus from Scotland. Those soldiers are there for the benefit of the right-wing thugs in Washington!!! Yes Dan , of course sodliers are there for their benefit and their claim to protect us is ridiculouse, as we were attacked because of their military operations. Nobody asked their protection. The comments for this link were only supposed to be for thanking our fallen soldiers. Could you please refrain yourselves from making political comments here? Thank you. Sorry, but I can't refrein from political comments against the war. American soldiers made the choice to enlist, but their victims had not the chance to avoid the war. Thank you,salerno. Nothing can be closer to the truth!!! If you're so upset, write your Senator, Governor, or Representative. You could also move out of the U.S. Or, you could enlist and see what it's like. Or, you could run for President. It's YOUR choice. Just quit being a moron on pages that are trying to honor our fallen troops on Memorial Day. Yes, I am a Democrat. Will you kindly cut the right-wing bla-bla-bla out? It gets just as old and corny as it is phoney!!! Does anyone here believe that Barack Obama truly cares about these troops as long as this war remains politicall popular? Unfortunately,as long as that's the case,we'll be stuck there and he'll be reelected next year! Thank you Kris. You will be missed by many. This time I agree. I am thankfull with the soldiers death. Thanks God for the dead soldiers. I thank the solder for his service, his valiant conduct and his patriotism. I thank them all for being stalwart, brave American soldiers. ‎"I pledge allegiance to the flag of the United States of America, and to the republic for which it stands, one nation under God, indivisible, with liberty and justice for all." Justice for all, with the exceptions of the millions of people (including civilian men women and children) killed by the US in the last 70 years. I would just like to say Thank you. No honor for the baby killers. As you kill, you will be killed. The world is safer now. Thank you salerno,but this obscene war really needs to end soon. Sadly enough,it won't as Barack Obama gets reelected next year. Another interesting graphic would be to overlay the casualty/injury information with the red/blue state maps. 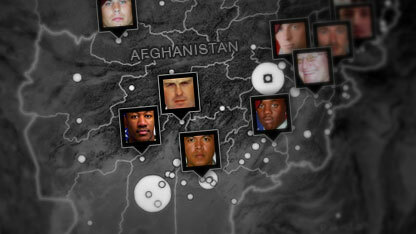 The interactive graphic of the people who have been killed while in Afghanistan is stunning. Could you please produce a similar graphic of the injured, the extent of their injuries and their ages? That would shock most.